Essential oils are among many natural remedies for arthritis pain relief. They are a distilled form of a particular plant’s oil, and are concentrated and potent, which makes them highly successful at alleviating many health ailments, including arthritis, when applied topically. Arthritis is a disease of the joints that causes swelling and pain. A little over 52 million adults in the U.S. have a form of arthritis, and that number is expected to rise to 67 million by 2030. The most common types of arthritis are osteoarthritis and rheumatoid arthritis. As a natural treatment for arthritis, essential oils can work either on their own (if they can be managed sufficiently) or in conjunction with medicine prescribed by a doctor. Quite a few essential oils do a good job of alleviating arthritis pain, including birch, chamomile, myrrh, lavender, menthol and cayenne, but the ones below tend to do a better job. Certainly try as many of them, if not all, to find out what works best for you; after all, what works for one person really may not be as effective for another. Applying the oils topically delivers the best results because the skin will absorb it and get it into the bloodstream quickly. They can also be ingested (though not all of them, so it’s best to check first) or diffused in the air with an aromatherapy diffuser (like a mini humidifier that mixes the oil with water and sprays it into the air as a mist). 1. Ginger essential oil: Ginger is a flowering plant, and it is the root (rhizome) that is used. It is an amazing healing plant because of its antibacterial and anti-inflammatory properties making it a go-to remedy for many gastrointestinal issues, including gas and bloating. The anti-inflammatory properties are what help ease the swelling and joint pain associated with arthritis. 2. 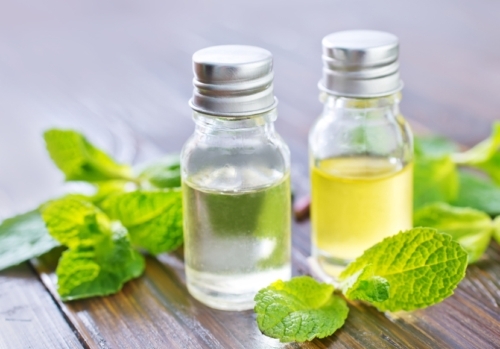 Peppermint essential oil: Peppermint oil really is a magical herb that eases so many issues, from headaches to tummy troubles. The menthol found in the leaves has anti-inflammatory properties and will ease pain and reduce inflammation. But mix it with a carrier oil (jojoba or almond are gentle and most commonly used) before applying topically, because peppermint is very strong and can irritate the skin. 3. Orange essential oil: Orange also has anti-inflammatory properties which makes it an excellent choice for reducing pain and swelling associated with arthritis. Orange is a mood energizer, and it smells great, to boot. Diffuse this one for the added boost in mood, and add a few drops to a carrier oil and rub it into sore joints. 4. Rosemary essential oil: Rosemary is ranked as one of the best oils to use for arthritis because of its analgesic and anti-inflammatory properties. It will help promote circulation. 5. Marjoram essential oil: Marjoram is wonderful for bringing relief to stiff joints because it has calming properties. Make sure to not apply it to any broken or damaged skin, because it can be an irritant. “What Are the Best Essential Oils for Arthritis?” The Fusion Model web site; https://www.thefusionmodel.com/what-are-the-best-essential-oils-for-arthritis/, last accessed February 24, 2016.